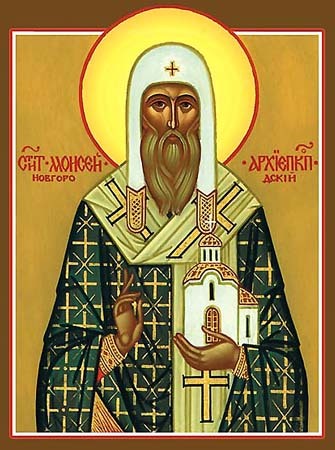 Saint Moses, Archbishop of Novgorod (1325-1330, 1352-1359), in the world Metrophanes, was born in Novgorod. In his youth he secretly left his home and entered Otroch Monastery in Tver, where he became a monk. His parents found him, and at their insistence he transferred to a monastery near Novgorod. At this monastery he was ordained as a hieromonk, and later he was appointed archimandrite of the Yuriev Monastery. After the death of Archbishop David of Novgorod, Saint Peter (Dec. 21) consecrated Moses as Archbishop of Novgorod in 1325. This was the first episcopal consecration to be performed in Moscow. Saint Moses did not guide his Novgorod flock for long, however. The quarrels and contentious factions, the conflagrations and other misfortunes weighed heavily on his soul, which sought monastic solitude. After four years, he petitioned to be allowed to retire and live in asceticism. He was succeeded by Saint Basil. 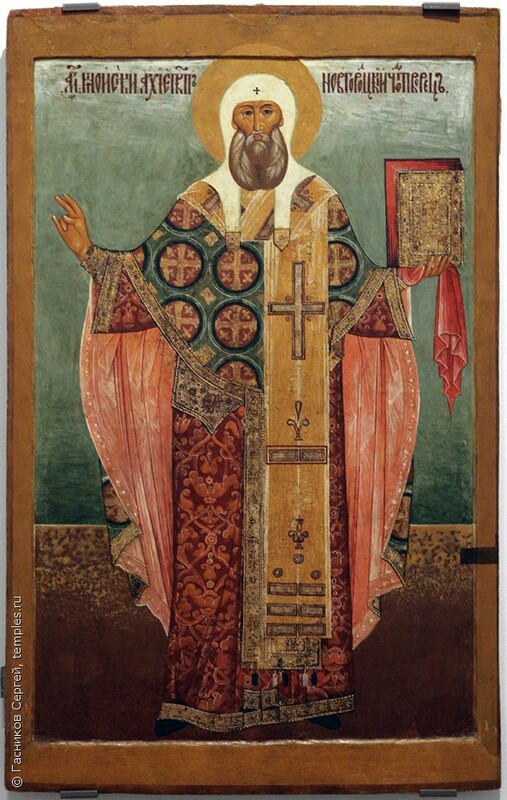 In the year 1354 Patriarch Philotheos of Constantinople (1354-1355, 1364-1376), as a token of his deep respect for Saint Moses gave him permission to wear polystavrion vestments (“many crosses”), and even sent him a set. He also permitted Saint Moses to deal directly with the Patriarch of Constantinople without intermediaries. Archbishop Sergius of Novgorod, who came there from Moscow in 1484, ordered a priest to open the grave of Saint Moses. “I dare not be so bold as to open up the relics of the hierarch. 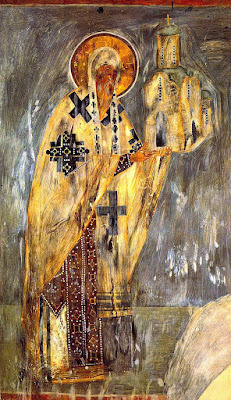 It is your task as hierarch to open the grave of a hierarch,” he answered. “Look what is on this corpse,” said the infuriated archbishop, but he was soon punished. He went insane, and was not able to govern the diocese and did not become well until he took the schema at the Khutyn Monastery. 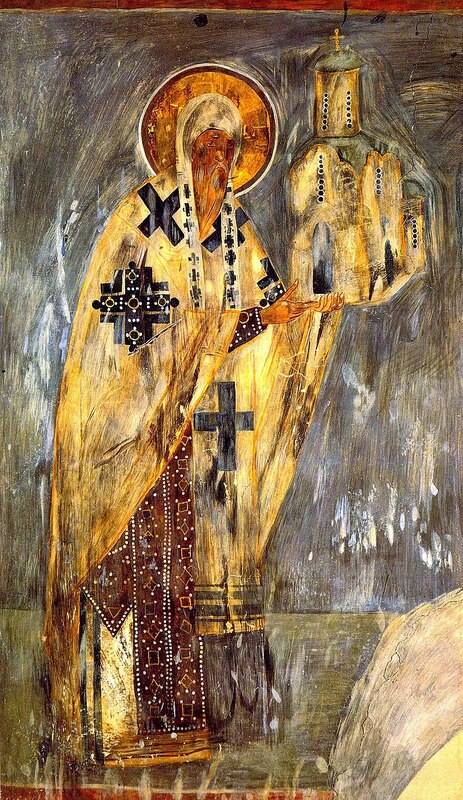 He died in 1504 at the Trinity-Sergiev Monastery. The Feast of Saint Moses on April 19 commemorates the uncovering of his incorrupt relics in 1686, which produced a number of miracles.